A tree-hugging professor from UCDavis eh? What makes you think he'd check the facts before flapping his gums? California Chapparal is a "Lose-Lose" situation for the forest service or fire fighters. Most of the chapparal is fire dependent and resistant. Take manzanita, the seeds require fire to geminate and an existing shrub burned completely to ground will stump sprout. Same goes for Ceanothus and scrub oak. So it doesn't matter, you can let the fuel build and its a fire hazard or it could of burned 2-3 years before leaving dry grasses and stump sprouted shrubs and it will burn. Especially with 50-70 mph winds, there is just no stopping it. They can blame all they want old growth, new growth...didn't matter last week. Nothing would matter when you have unseasonably warm temps, extremely dry conditions and most worst of all, high winds. There's no fighting a fire in winds like that, it's get out of the way and save what you can. Mikehike and Caddis got it right: get out of the way when the wind blows. The only big fire I've been close to was the Canberra (Australia) fire of January 2003, and it was a similar story: drought conditions followed by a hot, dry wind. The speed with which the fire moved was one of the scariest things I've ever witnessed. The Angora Fire in Tahoe started in an area that had a controlled burn 1 year before. Once again there were 50mph winds, this pushed the fire into areas loaded with fuel and then it exploded. The intersting thing is, the area which did have the controlled burn did not lose to many trees and parts of it don't even looked burned. Chapparal is a different animal, the soils repel water the plant foliage give off oily stuff which ignites rapidly. The lower in elevation you go in california the more fire dependent the plant communities become. Whether its dry grasses or chapparal shrubbery this ecosystem will burn and contuinue to burn, until california turns into a tropical weather pattern with year round rain. The line is the Mexico/US border. Because of a century of fire suppression in Southern California, huge even age stands of brush have developed which do support large intense fires. The fact that they burn through previously burned sections doesn't necessarily weaken that model. Interestingly, during this last fire event, the sat photos showed fires also burning in Baja, but they seem to have gone out sooner. Maybe Bonnicksen had a wee bit too much coffee that morning. BSquared is right, Barbour is a very well respected researcher at UCD. Bonnicksen (also respected) is a UCB graduate -- maybe it's a school rivalry thing?? In any event, it's an authentic research topic and didn't strike me as a fling at USFS firefighters. Obviously the home building and construction, anything goes sprawl growth avocates, and area and state politicians that draw up zoning and building codes in all these natural fire areas ought to bear the bulk of blame. Although the huge 2003 conflagarations spurred tightened building codes and planning in Southland areas, there are still vast numbers of already built homes that continue to remain fire traps mainly because most people gamble it won't happen to them so would rather spend their money on a new 42 inch wide screen tv. They also don't want to cut back brush because their overgrown vegetation and shady trees are attractive thus keeps their home values higher. A prime reason many move to such hilly vegetated areas. Why are so many homes roofed with shake shingles and adorned with the usual untreated wood decks in their backyards? Especially in the many unicorporated areas that are often in outlying areas near the chaparral, it is up to the individuals to comply with recommendations and not surprisingly many choose to keep their heads in the sand. Thats an intersting map, it would be intersting to see how it matches the terrain. Here is an article I found on "Fire dependent plant communities"
Chaparral is a general term that applies to various types of brushland found in Southern California, Arizona, New Mexico, and parts of the Rocky Mountains. True chaparral exists primarily in Southern California and describes areas that have a Mediterranean-like climate with hot, dry summers and mild, wet winters. The chaparral in this region is primarily fire-induced, and grows in soils that are shallow and unable to hold water. Generally, the terrain is steep and displays severe erosion. 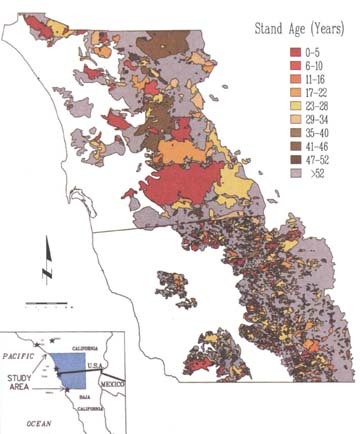 Variations in species cover throughout the area is attributed to the soil type and exposure, the altitude at which it grows, and the frequency of wildland fires. Plants in this ecosystem are adapted to the Mediterranean climate, local soils, and the fire regime. Fire adaptations include vigorous stump sprouting after fires by many shrubs, including the manzanitas, Ceanothus, and scrub oak. Chamise produces dormant seeds that require fire for scarification; these seeds create a large seed bank during non-fire years. In addition, most chaparral plants seed quickly, usually within three to five years after sprouting. Many of the shrubs, especially chamise, promote fire by producing highly flammable dead branches after about 20 years. Another chaparral plant, Ceanothus, has leaves that are coated with flammable resins. Fires occurring at intervals greater than 20 years are often high intensity because of the large amount of fuel existing in shrub tops. Many nutrients are locked in the foliage of chaparral plants. Through burning, these nutrients are recycled back into the soil. After fires in chaparral, forbs are usually profuse on the newly opened floor. After a year, the plant community is dominated by annual grasses. Five years after a fire, chaparral shrubs once again dominate the ecosystem; for this reason, more frequent fires favor grasses over shrubs. Fire has not been successfully removed from this ecosystem, so how the community would respond to lack of fire is not well-known, although non-fire adapted trees and shrubs might replace the chamise, manzanita, and Ceanothus. Mexico lost around 110 homes in the spate of fires Oct 21-26 -- chiefly in the Tiajuana/Ensenada area. They also had significant home loss in the 2003 blow. Not as bad as north of the border, but they are not immune. Many differences between Mexico and the U.S. A lower population density outside the urban cores. They have a lot fewer homes scattered around and in the brush. They also do not have an army of lawyers ready to sue if local government does not allow development in a fire prone area, then turn around and sue again if homes burn. Nor do they sue if smoke from prescribed burning drifts across their yards or heavy equipment starts fuel reductions on the hillsides behind the homes. Allowing fires to burn is a non-starter in southern California. Too much area at risk. You can only allow fires to burn in remote backcountry areas where if the weather changes it still will not threaten homes or critical resources. There is no area remaining in southern California that meet that criteria. There is no area in Southern California where fires can be allowed to burn safely. A wildland fire policy (let burn) was considered for the federal wilderness areas in So Cal a few years ago but analysis showed it just was not feasible. Too many other factors. That door is closed. Prescribed burning is also iffy. Air quality regulations simply do not allow enough burn days to make any difference. The inability to meet the impossible prescribed burning targets is among the reasons the Sierra Nevada Framework failed. So Cal is even more restrictive. Mechanical treatment on steep slopes and erodible soils is also not an option. There is no realistic solution to making the hills less flammable. All options have already been removed. The only remaining option is to make homes less flammable. The federal and state governments do not have the authority to do so. That is the exclusive domain of local government. After the 2003 fires the state had the bully pulpit and made a plethora of strong recommendations, but local government was slow to act on them, if at all. The exception is Ventura County, with strict fire and building codes that are aggressively enforced. Their fire losses are a fraction of the other southern counties. The USFS fire budget has increased 450% since 1992, and is now robbing funds from other functional areas -- wildlife, watershed, recreation, etc. Approximately 1/2 of the total USFS fire budget is spent dealing with private lands inside and adjacent to the National Forest boundaries. The FS has no jurisdiction over land use on the private lands, yet is forced to expend funds there. This is being discussed at the Washington DC level. The FS leadership understands the problem and knows the solutions, yet lacks the power or legal authority to implement them. CalFire is in the same position, although I do not have the current budget figures for them. Expect some major changes in fire policies in the next couple years. A lot fewer state and fed firefighters may be responding to threatened homes in the future unless local government steps up. Another lesser discussed reason for the home losses this year is the change in structure triage policies and guidelines implemented following last year's Esperanza Fire. Firefighters are now encouraged to pass by a threatened house rather than risk lives to try and save it. If the homeowner, homeowners association, or local government has not implemented basic fire reduction measures crews have standing orders to let it go and find another home to defend. No more firefighter funerals from a house that should have never been built. Thankfully, the media has not picked up on the change in policies, or there would be a firestorm of editorials railing against the fire agencies.